The fully working replica of the Robert Stephenson-designed Locomotion No. 1 has launched a month of festivities on one of the world's oldest railways. 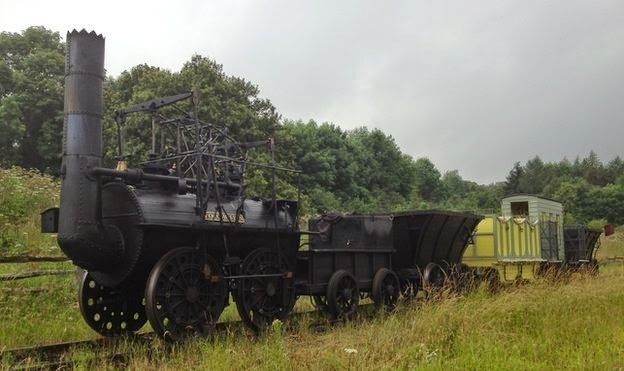 The Tanfield Railway, near Sunniside, Gateshead, is marking 175 years since iron rails were laid on the route. Trains took coal from the Tanfield area, near Stanley, to the River Tyne at Dunston. Having used wooden rails since 1725, rail experts said it heralded a new era of transport and mining in the area. Tanfield Railway director David Watchman said: "This is perhaps one of the earliest-recorded cases of modernisation in transport infrastructure. "The rebuilding with iron rails made possible the introduction of steam to the route and the collieries it served, both in the shape of stationary engines and locomotives. "We know that Marley Hill colliery was the location for some of the first locomotives introduced to the route and that they were very similar to Locomotion. "This visit is about highlighting this exciting and important, but virtually forgotten, era of the North East's railway history." Stephenson's Locomotion No. 1 was the first steam locomotive to run on a passenger line, making its debut on 27 September 1825 on the Stockton and Darlington Railway.